« Alien Hominid – Awesome Game! Before we begin, remember do not copy DVDs that you do not own! It is illegal to make a copy of a movie for use if you do not own the original. SheerBoredom.net does not in any way endorse violation of the valid rights of copyright holders. Please check your country’s laws and regulations on backing up copyrighted material before proceeding with this guide. Simply download both pieces of software and install both programs. Now you can continue with the tutorial. At this window choose your preferred language to extract from the DVD. If you leave the options to “All Languages”, then DVD Shrink will keep all the languages available on the disc, however it many times has to shrink the video quality to keep all of these on a single DVD-R single layer disc. After choosing your preferred languages from the two drop down menus simply hit “OK” and this will apply the settings. Now we can close DVD Shrink and move onto the next step. Now we begin to extract the DVD image by first inserting the desired DVD you wish to backup in your DVD drive and then opening DVD Decrypter. 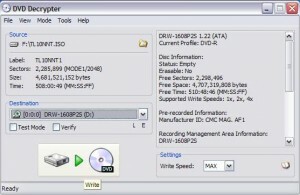 DVD Decrypter should automatically choose the drive that has the DVD movie in it as long as only one disc is in your computer. 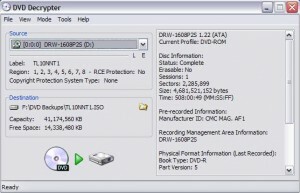 If you have multiple discs in your computer you may have to choose the disc drive where your DVD is by selecting the drive from the menu labeled “Source” by clicking on the drive with the DVD in it from the drop down menu. After selecting the right DVD to backup, we then move below the source part of the window and will now select a “Destination” for the DVD image before it becomes compressed to fit on one disc. You can choose a destination by clicking the little folder icon with the magnifying glass on it to browse to the location to save the disc image. Make sure to choose a location you can find easily and that has at least 8-9 gigabytes (8192-9216 kb) of free disk space available. We will use location of this image later in the tutorial. Now we are ready to extract the DVD and make the uncompressed backup image of the disc. To start this process simply clicking the button that shows a DVD disc with a green arrow pointing to a hard drive. This process will take some time as it is copy everything on the disc, bit by bit. After DVD Decrypter finishes, simply close DVD Decrypter and proceed to the next step. Then select the image that we created earlier. After you see all the files loaded into the windows in DVD Shrink, now it is time for DVD Shrink to compress the image to fit on one disc. Do this by simply choosing the Backup button at the top of the DVD Shrink window . On this window choose ISO Image File and burn with DVD Decrypter. Next choose a target for the new compressed image (it can not be the exact same location as the original, so I would just suggest making a a folder next to the other one and then you can delete both images once you are done burning the discs.) You can also choose other settings for your new backup of the DVD on the other tabs in this window, however I recommend leaving these settings to the defaults, unless you know what you are doing. 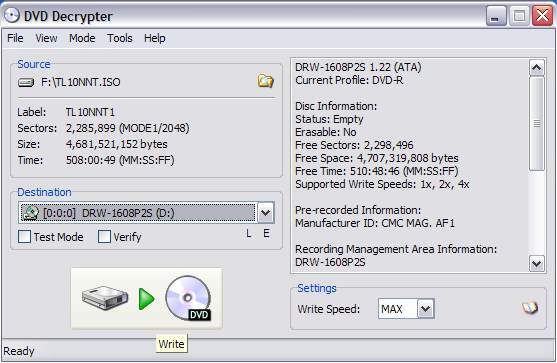 Then simply hit OK, and DVD Shrink will make the new smaller disc image that can fit on one DVD for you and open DVD Decrypter to burn the DVD when it is done. You almost have your the backup complete now, only one last thing left after DVD Shrink finishes, and that is to actually burn the disc image to a disc. 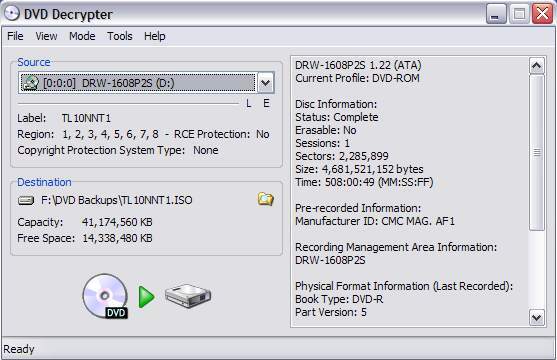 Once DVD Shrink is completely done compressing the image, it will open DVD Decrypter with all the necessary settings already taken care of. The only change I recommend is to skip the verify step by unchecking the box under the destination choice. Then simply click the picture of the hard drive to the disc and voila you are burning the backup of your DVD movie. This entry was posted by John Jones on July 16, 2008 at 8:47 PM, and is filed under Guides. Follow any responses to this post through RSS 2.0. You can leave a response or trackback from your own site.